Georgia is a country that just seems to have it all. A thriving capital that oozes cool from every corner, dazzling peaks that tumble into vivid green meadows, an ancient wine region that will have you hooked at first sip and some of the most delicious food I’ve ever eaten. It’s a whirlwind of chaotic bus journeys, epic views, enchanting villages and landscapes etched in the harrowing tales of Georgia’s tumultuous past. It’s a place alive with history and culture and enough wonderfully organised chaos to keep even the most intrepid traveller on their toes. It was one single image that drew me to Georgia many years ago, a glossy double page spread of Gergeti Trinity Church all gussied up in a blanket of glistering snow, but as it turns out, there’s plenty more to love in this beautiful country caught between the High Caucasus mountains and the burnt orange steppe. After an incredible 6 weeks, it’s safe to say I’ll be back, but for now, these were my favourite things to do in Georgia. For useful things to know before you go, check this post on Georgia travel tips. Put simply, Tbilisi is just a damn cool city. Its frenzied streets are both overwhelming and wholly intoxicating, where wide gentrified boulevards give way to a maze of old town streets; brightly-coloured, haphazard and downtrodden. Its a city of frenetic markets and fantastic views, where the food and wine are far too easy to love, long walks and getting lost are the aim of the day and being scrubbed up by a bare and buxom local are all in a day’s adventure. 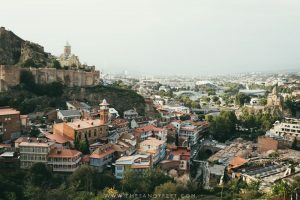 Though many have attempted to tap the city as the ‘new Berlin’ for its mix of legendary nightlight and alternative edge, in reality, Tbilisi is something entirely different, and I absolutely loved it. For travellers in search of adventure, it is the raw and rugged wilderness of Svaneti which offers up the greatest allure. Aside from the emblematic stone towers that stand guard between the mountains, an ominous nod to the region’s bloody past, Svaneti is a feast of crumpled glaciers, sweeping valleys, lush meadows, snow-capped peaks, densely forested hills and an everpresent ethereal mist. 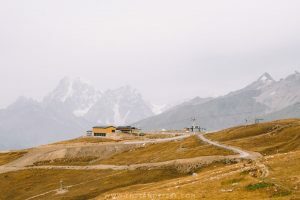 Mestia is the region’s main hub and acts as the starting point for a number of fantastic day hikes as well as the incredible 4-day Mestia to Ushguli trek. For those not all that into hiking, you’ll be glad to know there’s still plenty to be enjoyed amongst the villages and from the car window. From afar, Vardzia is a curious mosaic of hand-hewn windows carved into the mountain. Up close, those windows conceal a maze of rooms and snaking tunnels from an ancient world, one where the rocky cliff face was transformed into a city and apothecaries, wine cellars, bakeries, chapels and living quarters all existed side-by-side. 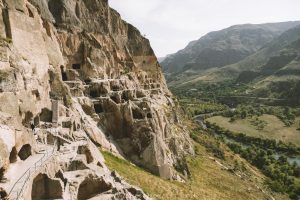 While Georgia plays host to many ancient cave cities, Vardzia is perhaps the most impressive, offering up an extensive network of tunnels for exploration. Kutaisi has a very different feel to Tbilisi. Its beautifully timeworn old town is all shiny cobbled streets and pastel facades that conceal cosy restaurants and friendly hole-in-the-wall eateries. The decidedly less tranquil market district is draped in the thick scent of aromatics that gush from the high piles of spices, herbs and the ubiquitous Svaneti salt. Bound by an impressive wall relief, tiny stalls spill out onto the pavement to serve your every need, be it fried treats, second-hand clothing, pharmaceuticals or a much-needed hair cut after months of neglect. 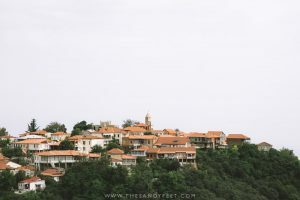 While Kutaisi is often overlooked in favour of Tbilisi and Batumi, or used as little more than a transfer point between the mountains and the beach, I loved my time here filled with lazy afternoon strolls and excellent food in an everyday Georgian town. 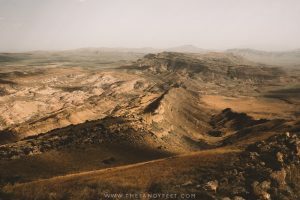 A Day Trip To Martvili And Okatse Canyon – Is It Worth It? Hurtling down the Georgian Military Highway, verdant green hills and shimmering lakes whip by beyond the window, ancient church towers dot the surrounding hilltops and the serpentine road climbs higher into the mountains. 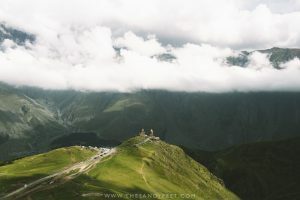 Kazbegi (or Stepantsminda as it’s now officially called) is the prime destination for many hikers in the region. Gergeti Trinity Church silhouetted against a backdrop of jagged peaks has become an icon of the country, while the white brushstroke of Gergeti Glacier slithering down Mt Kazbegi in the mountains beyond is a prize worthy of the arduous hike it takes to reach it. Seeking even more adventure? Hike beneath the jagged massif of Mt Chaukhi, mountain bike through the sweeping Truso Valley, traverse the gentle folds of Sno Valley or simply kick back on your guesthouse terrace and soak up the beauty of one of Georgia’s most spectacular settings. 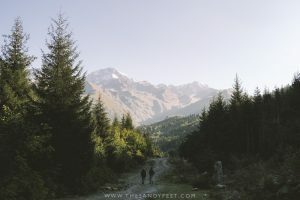 If you love being out in nature, hiking in Kazbegi is an essential thing to do in Georgia, and at just 3-hours from Tbilisi, it’s perfect for those without the time to commit to Svaneti. As far as Georgian cave monasteries go, Davit Gareja doesn’t quite match up to the labyrinth of Vardzia, but its setting amidst the burnt orange desert on the fringe of the Azerbaijani steppe is something quite remarkable. Crumbling watchtowers stand guard atop their rocky perches, intricate century-old frescoes adorn the vast tumbledown network of caves and, in the still inhabited parts of the complex, robe-clad monks wander in silence. 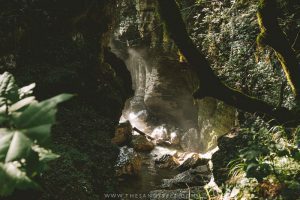 Though this harsh and unforgiving environment is perhaps the last place you’d expect to find such a holy site, it is perhaps what makes this place so unique, and for those without the time to make it to Georgia’s other famous cave monasteries, this is the next best thing. Fondly referred to as the ‘city of love’, Signagi is indeed an incredibly lovely place to visit. Poised on a hilltop overlooking the hazy plains of the Alasani Valley, this enchanting little village is a place to slip into a slower pace, get lost amongst the maze of quaint cobbled streets and enjoy the views from the city’s crumbling fortifications. And then, of course, there’s the wine. Nestled in the heart of Georgia’s wine country, Signagi is the perfect place for a boozy afternoon of wine tasting or to kick off a jam-packed tour of the wider Kakheti region, an area that has cultivated wine for some 8,000 years. For such a small country, Georgia packs a lot in – stunning mountains, charming towns and an eclectic mix of cultural sights. Intent on travelling slowly through the country despite a growing list of places I was keen to visit, there were a number of trips that had to be dropped from my itinerary, most often the ones that required a somewhat convoluted transport route. These were some of the spots I’d be curious to visit the next time around. Lagodekhi National Park | Strung along the border between Georgia, Azerbaijan and Russia, this protected nature reserve is a lush tangle of dense, vine-hung forests, gushing waterfalls, high altitude lakes and plenty of hiking trails to lead you deep into the mountains. Batumi | Batumi seems to be the kind of city you either love or you just don’t quite get the hype. Some fall hard for the combination of wacky modern architecture and new constructions parading as old-world charm, the multitude of casinos and the lively beach scene, while others think the overwhelming injection of strange delights and forced, tacky glitz makes it feel like it’s trying a little too hard. If you like weird, it might be just your kind of thing! 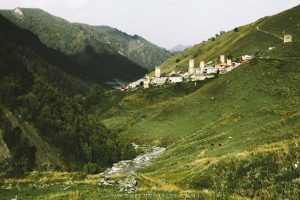 Tusheti | Next time I visit Georgia, Tusheti will be the first things to creep onto my itinerary. This remote corner of mountains, rumoured to rival the rugged beauty of Svaneti, is visited by far fewer tourists than elsewhere in the High Caucasus but offers up spectacular views and an excellent network of hiking trails that are ripe for exploration. By Plane | Thankfully, growing tourism in Georgia has brought about an expanded network of flight services, including major European airlines and budget-friendly Wizzair. Tbilisi is the main point of entry, though Batumi and Kutaisi generally provide cheaper connections and mean you don’t have to backtrack across the country for your return flight. Start searching for flights to Georgia here, or download the Skyscanner App for the best deals at your fingertips. By Train | If you’re already travelling in the region, Georgia is connected to its Caucasian neighbours by rail. International trains link Tbilisi with Yerevan, Armenia and Baku, Azerbaijan. Check here for timetables and tickets.